Super Bowl XLVIII – Recipe and Printable Round Up! It’s come to my attention that once again several of the links leading to this post yesterday did not work. Since I have no idea why or how to fix it, here’s a repost again this morning for those of you who missed it! This year, Captain America and I will be hosting his family’s annual Super Bowl party at our house. Usually our get-togethers are hosted by my parents-in-law, at their house on the river. It’s a beautiful setting, but quite a ways out of town, and the room housing their television doesn’t lend itself easily to 10 people (let’s get real, not many rooms do!). I’m a little stressed about having everyone over, since we very recently moved the rest of my belongings over to our house and there are still boxes everywhere (I know that sounds ridiculous since we got married in September, but we chose to leave some of my furniture there so wedding participants could visit for free, and then so my aunt and cousins could stay after my grandmother passed), but I know those won’t be too hard to organize. And the rest of it should be pretty easy, at least! We’re going to start with a great chili for our main dish, it’s a great traditional game day food, plus it feeds a lot of people. I wish I had a recipe to share with you all, but I’m going off of one my old roommate shared with me years ago, and it’s never been officially written down – we just kinda play it by ear! My mother-in-law and father-in-law are in charge of bringing the corn bread (because seriously, you can’t have chili without corn bread), and they’re always in the kitchen together, so I know it’s going to turn out great. For the kiddoes, in case the chili doesn’t take, we’re making Macaroni and Cheese Muffins based on the recipe I found at 30s Magazine. (I have to admit, the kid in me is a little excited to try these out as well…) Don’t they look yummy?? My brother and sister-in-law are in charge of bringing the fruit salad – which is great because we haven’t had a party at our house before, and I have a bridal shower to attend the day before, which means less time to prepare – but also kind of a bummer, because I found this fantastic fruit salad recipe on Pinterest the other day that I’ve been wanting an excuse to try out! Apparently it’s the best fruit salad ever, so if it’s something that’s on your menu this game day, why not check out the recipe? Captain America’s parents always lay out a little spread of appetizers: usually cheese and crackers or a nice bread with a tasty spread – and with 10 people over for a long game day, I think some light grazing will definitely be in order! So we’ve got the ingredients all set up to make this fresh Mediterranean Veggie Dip from Better Homes & Gardens to spread on crackers or flat bread – with one minor change: substituting greek yogurt in for the yogurt cheese! And tomorrow after the Bridal Shower Extravaganza I’ll be getting the crock pot out to prepare some Crockpot Cinnamon Roasted Almonds from the recipe I found on Suburban Epicurean. As far as the decorations go…well, I wish I had enough time to create these fun game day paper chains in both team’s colors, or set up this cute football themed take on “Pin the Tail on The Donkey” for the kids to play with when they start getting antsy. But I think we’re just going to have to settle for a couple of fun printables instead – like this great “Who’s Going To Win?” Game Poster from Confetti Sunshine! After scouring Pinterest for hours, there were so many more great finds that I had to relegate to my “next year” file…but if you’re still looking for some last minute inspiration, be sure to check out my Super Bowl Pin Board for even more fantastic recipes and free printables! And no matter who you’re rooting for – I hope you have a great Super Bowl Sunday!! Are you a football fan? Will you be watching the Super Bowl this Sunday? Who will you be rooting for? Are you throwing a party, attending one, or enjoying your time at home? What are some of your favorite game day recipes? Uh-Oh…It’s That Time Of Year Again! 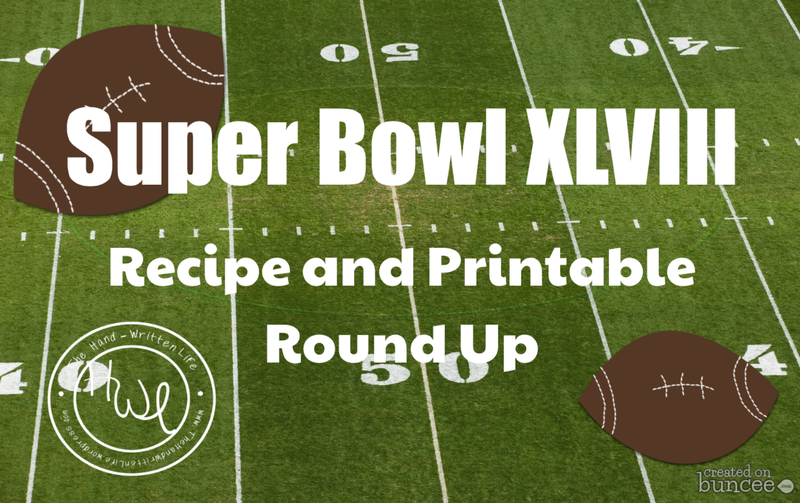 ← Super Bowl XLVIII – Recipe and Printable Round Up! Thanks for including me and have a great Superbowl Sunday! Thank you for the great recipe!! My nephew devoured them :) I hope you had a wonderful game day as well! Thank you for the share!! :) It was a really fun party, thanks – I hope you are having a wonderful weekend!! I love your kids Mac & Cheese muffins and your delicious looking Almonds. Thanks for sharing at Wonderful Wednesday blog hop. I pinned it!! Thank you for stopping by, commenting, and pinning, Diane! Always great to hear from you :) The Mac and Cheese Muffins went over quite well with my nephew, and everyone loved the Cinnamon Roasted Almonds – I’m definitely going to have to make this recipe again!